Tonight's fridge foraging used chicken thighs, stale bread, fingerling potatoes and lemon. It is a play on the famous Zuni Cafe Chicken with bread salad. Liberally sprinkle the chicken thighs with salt. Add grape seed oil to a cast iron skillet and warm over medium high heat. Brown the chicken skin side down for about 3 to 4 minutes or until the skin is golden brown. Remove and set aside. In the same pan add the potatoes then toss the potatoes with the chicken drippings. Add the lemon, garlic, thyme, and a big pinch of salt. Return the chicken to the pan and nestle on top of the potatoes. Roast the chicken for about 30 minutes or until a meat thermometer reaches 160°.Carefully remove the chicken, lemon, and garlic from the pan. Add the bread and toss well with the potatoes. Drizzle with vinegar then place the pan back in the oven to for another 5 minutes or until the bread is golden brown. 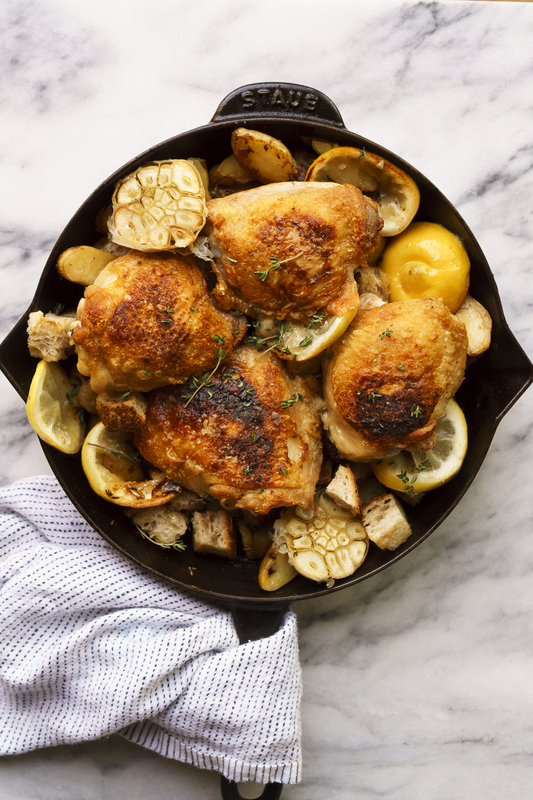 Return the chicken, lemon, and garlic back to the pan, taste for salt and serve warm.